Since its launch 6 years ago, Instagram has seen massive growth - over 300 million people use it every day, posting over 95 million photos and videos, and generating 4.2 billion likes daily. As a platform that applauds aesthetic quality and rewards engagement in spades, Instagram is at the top of many marketers’ lists when it comes to social media promotion and brand building. One of the best ways to capitalize on Instagram’s rapidly expanding user base is to run an Instagram contest. Running an Instagram contest is a simple and effective way to increase social engagement, engage your followers, and spread word about your brand. But how do you run a successful Instagram contest? To answer that, I’ve put together this 10-step guide on how to run a successful Instagram contest. Before you work on putting together your contest, you need to establish a purpose for your contest. NOTE: Though social engagement can also be a good goal, it’s only useful if you’re planning to do something with it. Remember that, at the end of the day, your goal is to get more customers for your brand. Likes and comments are great… but they don’t mean much if you’re not turning these engaged users into paying customers. On top of setting a goal for your contest, take this time to define a target market for your upcoming promotion. Do you want to target all of your potential users, or just a segment of them? For example, a clothing brand might make clothing for both males and females, but run a contest targeting only females to promote new women’s apparel. Defining your target early on in the campaign design process will help you maintain clarity and a consistent, focused marketing message moving forward. If you’ve been reading the Wishpond blog for a little while, you’ll have heard the following rule (probably multiple times): don’t give away an iPad. Nothing against Apple and its army of Retina display-toting devices… we just heavily discourage giving away contest prizes totally unrelated to your product. Keep your goals in mind - chances are you’re running a contest to boost product sales or connect with people who are interested in buying your products. Giving away an iPad (or any other random prize) is a magnet for low-quality leads - not a great way to maximize your contest ROI. If you don’t already have a prize idea in mind, one prize we do suggest is a gift card for your business, either on its on or as part of a bundle. This appeals to more people than just a specific product, as it gives winners some freedom to choose what they’d like to receive. Whatever you choose, keep it brand-related. Remember: if you run your contest well and choose your prize strategically, entrants who don’t win become leads you can nurture into sales. 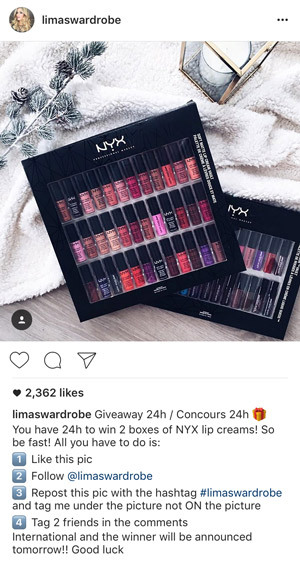 How it works: Just like the name suggests, like-to-enter contests require participants to like a specific contest image on Instagram. Winners are randomly picked from the pool of users who have liked the photo once the contest is over. Pros: Like-to-enter contests tend to receive the highest number of overall engagements compared to their counterparts, almost solely because of their low barriers to entry - all entrants need to do is double-tap a photo, and boom, they’re in! High engagement also means there’s a high chance your contest photo ends up on users’ explore feeds, increasing organic reach. Cons: Because like-to-enter contests are so easy to enter, people don’t need to spend a lot of time (or share a lot of information) to participate - meaning many entrants who really don’t care about your brand or product. On top of this, you’re not collecting any lead information besides usernames, which makes it tough to stay connected with entrants after the contest is over. How it works: Similar to like-to-enter Instagram contests, entrants comment on a contest photo to enter a comment-to-enter Instagram contest (go figure). Usually, entrants need to tag a few friends. Winners are chosen from the pool of commenters. Pros: Comment-to-enter contests similarly receive high engagement due to their low barriers to entry. Because they’re a little tougher to enter than like-to-enter contests it’s less likely uninterested users will enter, increasing the quality of the users who enter. On top of that, you can require entrants to tag friends or other users in their comments, which helps to increase engagement on your contest photo. Cons: Again, comment-to-enter contests don’t allow you to collect lead information, meaning lead nurturing is pretty far out of the question. My Thoughts: Comment-to-enter contests are great if you’re just trying to boost social engagement. Often, brands require entrants to follow their accounts to enter - though it’s tough to enforce this, most entrants will do it, giving your social following a lift. But, again, if you’re really looking to turn entrants into customers… keep reading. How it works: It’s all in the name. 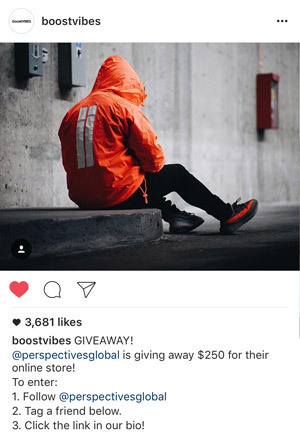 Repost-to-enter contests require entrants to repost the contest photo on their own feeds, often with a hashtag and a tag for the brand running the contest. Pros: Because people need to share a photo on their own profiles, your brand gets introduced to all of their followers, substantially increasing the number of people who have heard of your brand. And, since people tend to care about what they share on their Instagram profiles, you can bet entrants are potential customers who are interested and engaged. Cons: Same deal here. Though repost-to-enter contests are awesome for reaching new potential customers, you’ll still have trouble making sales using this contest type. 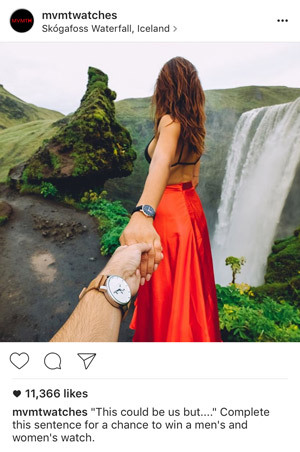 It’s pretty clear at this point that something these three Instagram contest types lack is the ability to generate, track, and nurture leads. How it works: Instagram Photo Contests direct entrants to a landing page hosted by a third-party app where they fill out a form and upload a photo from their Instagram feeds. Photo entries show up in a gallery where other users can vote for or comment on photos. Pros: Finally! Because Instagram photo contests are technically hosted on a third-party platform, they can be form-gated… which means you can finally collect lead information for your entrants. Chances are, leads you generate through this method are going to be very interested - meaning they’ll be easy to turn into sales in the future. Having a hosted photo gallery makes it easy for you and your participants to view others’ photos and engage with everyone who’s entered the contest. Cons: Unfortunately, there are barriers to entry aplenty when it comes to Instagram photo contests. Sending users to a third party page might be sketchy to participants, and requiring lead information can push users away from participating. Enabling the voting option might encourage cheating. 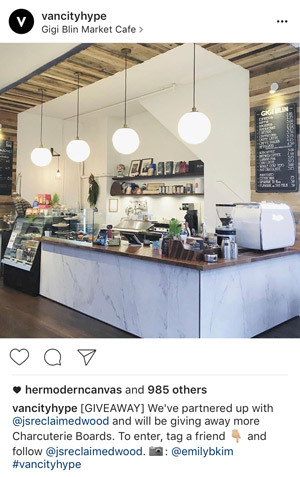 My Thoughts: To me, there’s no question about it: if your goal is to generate leads with the purpose of increasing sales, an Instagram photo contest is the way to go. The ability to collect lead information for nurturing in the future is infinitely more valuable than the few people who might choose not to enter because they don’t want to fill out a form. I think I’ve made it pretty clear that an Instagram photo contest is really the best overall option when it comes to running an Instagram contest, but nobody knows your business’ goals as well as you do. Whatever you choose, make sure it aligns with your goals. Once you’ve chosen your contest type, you’re going to want to create your hashtag. Having a hashtag creates a “thread” that links all of your contest entries and materials together. If you choose to promote your contest on other platforms, like Facebook or Twitter, it’s a good way to maintain consistency. Be campaign-specific: Choose a hashtag that relates directly to your contest so it’s easy to track and differentiate from other hashtags you might be using. Make it memorable so it’s easy to remember, in case people see it now but don’t enter until later. Make it short: Depending on the type of contest you run, your hashtag might be the only way you’re able to track your entries. Keeping your hashtag relatively short to minimize the chance entrants type it incorrectly. Make it unique: A common hashtag misstep is choosing a hashtag that’s already been used, or even worse - is still in use. Do a little research beforehand and make sure the hashtag you choose is unique. Now it’s time to design your contest! If you’re simply hosting your contest on Instagram, take time to put together a nice image that entrants can share or repost. Use a tool like Canva to assemble text over a photo from a site like Unsplash or Pexels. Choose a font that’s eye-catching and don’t write too much! You can put your contest details in the caption section of your photo, so I’d focus primarily on highlighting your prize in your contest photo. If you’re hosting an Instagram photo contest, you’ll need to design a page on the third-party app you choose (try Wishpond). With Wishpond’s drag-and-drop editor, it’s easy to design a gorgeous contest landing page that highlights your prizes and makes it easy to enter. When you’re putting together your contest, I’d opt to designate a theme for the photos people submit, like a color, product, or seasonal trend. This gets people thinking a little more about the photos they take and allows you to craft a focused narrative for your contest. And it just looks better! Send out a newsletter to your email list: Though your email list might be made up primarily of past customers, it’s a good way to re-engage them to encourage another purchase, or to remind customers who joined your list without buying anything that you’re still around. 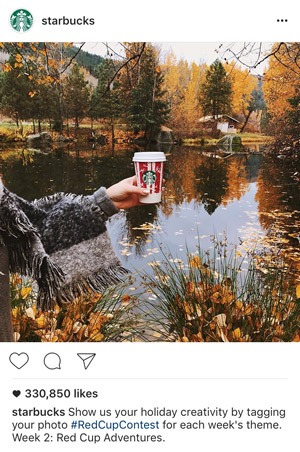 Shoot out updates to your social channels: Though organic social engagement can be underwhelming, it’s still something you should do when running an Instagram contest. Post your contest image to Instagram, Facebook, Twitter, and any other social channels you might have. Create an easy-to-remember shortened URL and link to it within your posts or on your Instagram bio. * Paid ads: Take advantage of ads on Facebook and Instagram to promote your giveaway. This is a great way to reach customers with precise targeting, and reach new people who might be interested in your brand. * In-store promotion: If you’re a retail store, promote your giveaway in-store as well! Use signage and encourage your patrons to enter and share the giveaway with their friends. If you’re running a [blank]-to-enter contest, your entrants haven’t actually submitted anything of their own to be voted on or judged. So, you’ll need to do a random draw. Get the names of your entrants and enter them into a site like RANDOMIZER OR WHATEVER to find your winners! If you’ve enabled the vote option for your Instagram photo contest, entrants can get friends and family to vote for their photo. The winner of the contest is the entrant whose photo receives the most votes. Though this is a great way to increase contest engagement and generate even more leads (you can require voters to submit their emails), it also opens up potential for cheating. If you choose voting as your method of deciding a winner, make sure you’re closely monitoring entries for false votes. The jury method takes a little more effort, but might be the fairest method to decide a contest winner. This method relies on a group of people to decide on a winner (like your employees), rather than using random draw or voting. If you have many entries, this might be impossible - but you can combine multiple methods to find your winner. For example, you can take the entries with the 10 highest vote counts and then use a jury to decide between these. Once you’ve chosen your winner, it’s time to let the world know! Post an update on your social profiles @ mentioning your winner. Highlight any honorable mentions as well - if you have prizes for runner-ups, great! Finally, ask your winner to take another picture with their prize, once they’ve received it. Share this photo as well! Even after your contest, there’s still lots to be done! Now that you’ve generated a bunch of leads from your contest, it’s time to do something with them! As soon as the contest ends and your winner has been announced, you’ll be left with one winner and quite a few disappointed participants. But this isn’t the end of the line for them. Set up an email newsletter to send out once the contest is over, including a “thanks for entering” and some sort of consolation prize - the best option is a coupon code for a discount on your website. Thanks for entering [contest name]! Unfortunately, you didn’t win this time - but all of our entries were great and made it a tough decision. As a special thanks for entering, we’d like to give you 30% off your next purchase at [brand]! We’ll be running another contest next month - keep an eye out for it! This tactic ensures you’re keeping these leads warm - and helps you turn disappointed contest participants into customers looking to take advantage of a great discount coupon. Though your margins on these customers may be smaller, something is better than nothing! ROI: Unfortunately, contests don’t come free. You need to pay for your prizes, any software you’ve used to build your contest, and for any ads you may have run over the course of your contest - that’s your investment. A little while after your contest ends, your return can be calculated by finding the total value of the customers who converted using your post-contest coupon. Before then, take note of any revenue spikes you might have on your website as the contest is running - this might be a good indicator that your contest is leading people to buy your products. Social engagement: Though this really is just a vanity metric, it’s a good one to monitor if social is one of your big revenue drivers. Make sure you’ve activated your Instagram for Business account so you have access to deeper analytics, like impressions and follower insights. Track the number of followers and impressions you received as your contest was running, and compare these numbers to previous periods to see the effect it had on your Instagram account. Website traffic: Changes in website traffic are a good measure of how interested people are in your product. Seeing rises in traffic during contesting periods means you’re catching people’s attention enough to get them to click into your website. This could mean great things and new opportunities - for example, you might want to add an entry popup to your homepage during contesting periods to take advantage of new traffic. And there you have it! 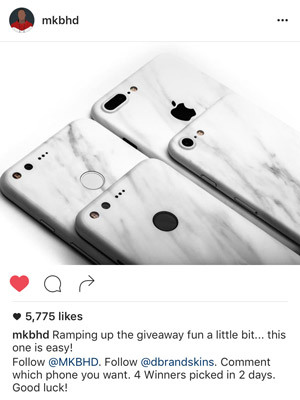 An 8 step guide to ensure your Instagram contest success. Contests might not be for every business, but they’re a sure-fire way to increase engagement, reach more potential customers, and generate great content from your fans and followers. What do you think? Are there any must-know contest tips I missed here? Let me know in the comments below!